2012 Rating report is ready for download! As last year, I’ve put together a Rating Report analyzing the results of last year’s long distance racing season. plus a lot more statistics. 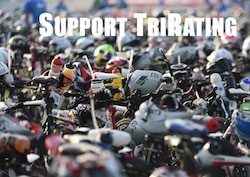 If you are just a little bit interested in IM-distance triathlons, this is a must-read! The feedback from my “beta-readers” has been very positive. Please use this link to get your free copy of the 2012 Rating Report. 2 Responses to 2012 Rating report is ready for download! thank you for your feedback. I don’t use age grouper results when I calculate the ratings. With regards to older results, their weight is decreased, so they count a lot less than newer results. Overall, I think this has been working quite well. I’ll follow up via eMail to discuss some more details – after all, improvements are always possible.